Thirty councillors were investigated in relation to alleged corrupt payments over the development of Quarryvale in west Dublin – who was compromised and who was vindicated? THIRTY DUBLIN COUNCILLORS were investigated by the Mahon Tribunal over allegations about corrupt and inappropriate payments in relation to the rezoning of land in Quarryvale, in west Dublin. The report commends some public representatives for refusing or returning payments coming from those with vested interests – while condemning the positions of others as “hopelessly compromised” due to their associations with developers or lobbyists. The report noted that Ardagh had “invited them to contribute to fundraisers in the knowledge that they were both associated with the Quarryvale rezoning projects” and that he did so at a time when he was aware that the project “would be subject to futher consideration bu South Dublin County Council” – and, as such, Ardgah’s entreaties to O’Callaghan and Dunlop were inappropriate. It also noted that Ardagh had been “less than frank with the Tribunal as to the extent of his contact” with Dunlop and O’Callaghan in relation to the project. The Tribunal reported that – as a matter of probability – Cllr Billane had at some point met with and was lobbied by Dunlop and/or O’Callaghan. The Tribunal said that Billane’s inability to recall the circumstances that led to the donation – particularly having regard to his acknowledgement that he had never previously succeeded in securing such an amount for a charitable cause – was “not credible”. It concluded that, as a matter of probability, Billane had requested a subscription to Citywise after O’Callaghan made contact requesting the removal of the 250,000 square foot retail cap on the Quarryvale project. The Tribunal said that such a request – even if it was for a charitable cause – was “inappropriate”. Cllr Boland told the Tribunal that he had received a sum of IR£4,000 in cash from Dunlop by way of an election contribution from anonymous donors on 11 November 1992. He said that, when he opened the envelope containing the cash he was “quite surprised” by the amount, as the most he had received in the past had been IR£500. Boland said he had assumed the donation was going to be funded by Dunlop until he was informed that it was via other contributors. Boland said that he absented himself from the 17 December vote because he had been approached by another party asking him to vote against the plan and offered £500 for doing so. He said that did not accept the money, but still he felt he had been compromised by the incident and decided to absent himself. The Tribunal accepted Boland’s evidence that he had absented himself because of his concern that he may have been compromised when he was offered the £500 contribution as there had been a link between the money and the Quarryvale rezoning – and not because of any payment made by Dunlop or anyone else. On 30 March 1998, the Tribunal Counsel noted an interview with Alan Dukes TD, in which Dukes alleged that Cllr Peter Brady, had told him that Cllr Brian Fleming had been offered £100,000 if he (Fleming) could ‘deliver’ the Fine Gael vote to secure the rezoning of the Quarryvale lands”. He did not suggest that Fleming had accepted the money and Fleming denied that he had ever been approached in such a way. On the issue of the conflict between Cllr Brady and Alan Dukes, the Tribunal found in favour of Dukes evidence. As such, it concluded that at some point between 1995 and 1998, Brady did relay to Dukes that Fleming had been offered IR£100,000 to deliver the Fine Gael vote in support of Quarryvale. In any event, Cllr Fleming denied ever having been approached with such an offer and denied that he had ever had a conversation with Cllr Brady about the subject matter described by Duke. The Tribunal was satisfied that Dunlop gave IR£2,000 to Cllr Cosgrave around May or June 1991, and concluded that the payment was “in all probability” solicited by Cosgave in the course of being lobbied by Mr Dunlop in the period leading up to the Quarryvale rezoning vote. The Tribunal said that it believed that at the time at which Cosgrave was solicited and accepted the election contribution, he was aware of Dunlop’s ongoing role in relation to Quarryvale – and described his conduct as “improper”. The Tribunal accepted Dunlop’s account of having met Cosgrave at Newtownpark Avenue in Blackrock on 11 November 1992, and that on this date he had given cash donations of IR£2,000 (later returned) and IR£4,000 respectively to Cllrs Pat Rabbitte and Cathal Boland. The payment of IR£1,000 in Jan 1993, the Tribunal said that the acceptance of this payment compromised Cosgrave in the performance of his duties as a councillor and was “improper”. In regards to an alleged payment of IR£2,000 by Dunlop to Cosgrave in 1993, the Tribunal was not satisfied that such a payment was made. Tribunal satisfied that M J Cosgrave solicited and received payment of IR£1,000 during the time of his January 1993 Seanad Election campaign – and that he did so “in circumstance where Mr Dunlop had lobbied him and would actively lobby him for his support for projects, including Quarryvale” on which Cosgrave would or might be expected to exercise his vote at County Council meetings. The Tribunal described Cosgrave’s request for money and his acceptance of it “compromised his required disinterested performance of his duties as an elected representative, and was improper”. Creaven acknowledged having been lobbied by Dunlop, stating that he had been lobbied both for and against rezoning. In response to the Tribunal’s inquiries as to whether or not he had received any payments in relation to Quarryvale, he said that he had received a “hamper” from the parties involved in the Quarryvale Shopping Centre. It noted that a Frank Dunlop & Associates Ltd invoice date 21 December 1992 for IR£64,897.78 sent to Riga included a claim for IR£15,636.77 partly spent by Mr Dunlop on Christmas gifts. The Tribunal was satisfied that Cllr Daly was lobbied by Dunlop in relation to Quarryvale and that it was “probable” that Daly requested an election contribution, given the imminence of the local election. However, it noted that – whether or not Daly had solicited the contribution – he had accepted it in the knowledge that Dunlop was a lobbyist for Quarryvale. Acceptance of the payment in such circumstances compromised Cllr Daly’s disinterested performance of his duties as a councillor, and was improper. The Tribunal was satisfied that Dunne solicited money from Dunlop for the 1991 local election campaign and that he did so “in the context of support he had given inter alia to the Quarryvale rezoning motion”. It accepted Dunlop’s evidence that he had given Dunne a sum of IR£15,000, and was satisfied that this payment was corrupt. Elliott said she had not attended any public meetings in connection with the re-zoning of Quarryvale other than Council meetings, and also acknowledged that she had been “lobbied by local organisations” seeking her support for and again the proposal. She said that she never received any payment or donations from parties involved in the project and, while admitting that she had dined in the company of Dunlop and O’Callaghan, said she had not been asked to cast a specific vote on the issue of Quarryvale. The Tribunal was satisfied that Fahey solicited a payment of IR£2,000, and that such solicitation and acceptance of funds had been improper. It was also satisfied that at the time of handing over the money, Fahey probably did allude to the support he had given to the Quarryvale project. Cllr Tony Fox was identified by Dunlop as a recipient of £2,000 in cash during the local election campaign. The Tribunal accepted Dunlop’s testimony, and was satisfied that Fox’s soliciting and acceptance of the election contribution was in the context of him being lobbied on the issue of Quarryvale, which is described as improper. Despite Dunlop’s testimony that there had been no express link between a IR£1,000 payment to Cllr Cyril Gallagher and Quarryvale, the Tribunal was satisfied that Gallagher had been ware of Dunlop’s role as a lobbyist for the project. Therefore, the report concluded that the payment had been improper. The Tribunal said it was satisfied that the “primary purpose” of Cllr Sean Gilbride’s decision to take a leave of absence from his teacher’s post and place himself on O’Callaghan’s payroll was “to enable Gilbride devote himself on a near full time basis to promoting the Quarryvale project for Mr O’Callaghan”. It described as “incredible” the suggestion that the political ambitions of an elected councillor could be properly served by that councillor placing himself on the payroll of a developer at a time when that same developer was promoting the rezoning of lands – a process in which Gilbrode was “intrinsically involved”. 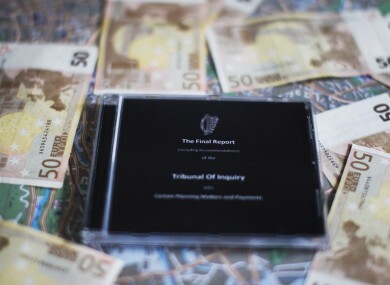 The Tribunal was satisfied that a cash donation of IR£500 received by Greene had been given to him by O’Callaghan via Dunlop, and the developer’s “generosity to Cllr Greene was not unconnected to his zoning ambitions for Quarryvale”. The report concluded that is acceptance of the money was “inappropriate” considering the fact that, within weeks of receiving it, Greene would be called on to exercise his vote in relation to a matter in which O’Callaghan had a significant vested interest. The Tribunal was satisfied that Dunlop paid Cllr Hand IR£20,000 in cash in two tranches of £10,000 each specifically in return for his support on Quarryvale, and that the payment was corrupt. The report also addressed an allegation by Dunlop that Hand had demanded IR£250,000 in return for his support for the project. Dunlop told the Tribunal that he had been offered IR£100,000 by Green Property to vote against the rezoning, and that he had repeated his demand for IR£250,000 on a number of occasions and asked for the money to be placed in an Australian bank account. Senior executives of Green Property testified to the Tribunal that they had no knowledge of Hand being offered IR£100,000 to vote against the rezoning proposal. It concluded that there was no evidence that indicated that such the amount of IR£250,000 had been paid to Hand, in Australia or elsewhere. However, it did accept that Hand had repeatedly requested the sum and that such a request constituted a “very serious act of corruption”. The Tribunal was satisfied that, during the course of the 1992 general election, Dunlop in all probability paid Cllr Fibarr Hanrahan either IR£2,000 or IR£2,500, with the principle reason for the payment being to secure his support for Quarryvale. It concluded that such a payment was “improper”. It also concluded that Hanrahan had corruptly solicited money from O’Callaghan in return for his voting support in December 1992, noting that Hanrahan had previously solicited IR£100,000 from developer Tom Gilmartin for his support if Quarryvale and was thus “not adverse to seeking money from developers”. The Tribunal concluded that a payment of IR£1,000 to Cllr Jim Larkin during a period around the 1991 Local Elections had been made. It was satisfied that a request for the money had probably been made by Larkin after he had been lobbied to support Quarryvale and that such soliciting and acceptance had been corrupt. The Tribunal rejected Cllr Donal Lydon’s evidence that he did not solicit a payment of IR£1,000 in or about May 1991, and concluded that such a payment had indeed been made between 16 May 1991 and 6 June 1991. It noted that Lydon’s behaviour had “grievously” compromised his position as a councillor and was improper. The Tribunal noted Cllr Marian McGennis’ “significant role” in relation to the Quarryvale rezoning proposal over the course of 1991 to 1993, and also noted that – in her initial dealings with the Tribunal – she had not been forthcoming about the extent of her involvement with Dunlop and O’Callaghan. The report was satisfied that McGeenis solicited a IR£1,400 cheque from Dunlop in July 1991, and that over a period of two months had been the recipient of a total of IR£6,500 from individuals closely associated with the Quarryvale issue. The Tribunal concluded that her behaviour had compromised her position as a councillor and had been improper. The Tribunal was satisfied that McGrath solicited a payment of IR£10,000 that was “in all probability” requested on the basis of the assistance he was giving O’Callaghan. It added that further payments of IR£10,700 and IR£20,000 could neither be described as political donations or “loans”, as had been suggested, and that such payments were corrupt. It concluded that McGrath’s duties as an elected councillor had been “hopelessly compromised” because of his “corrupt financial relationship” with Dunlop and O’Callaghan. The Tribunal said it was satisfied that Cllr Mitchell received a sum of IR£500 in cash from Dunlop at the time of the 1992 General Election. The report noted that Mitchell had not solicited the payment but, as she was aware of Dunlop’s links to the Quarryvale project, it was inappropriate for her to accept it. The Tribunal confirmed that Cllr Tom Morrissey had remained “staunchly opposed” to the rezoning of Quarryvale as a town centre at all times. The Tribunal was also satisfied that there had been no improper motivation from any party in relation to Morrissey’s firm producing diaries for Dunlop’s firm at a cost of IR£377.52, stating that this had simply been a “commercial arrangement” between the two men. According to the report, Cllr Ann Ormonde received in total at least IR£1,650 from Dunlop between the period January 1993 to 1998 – in the knowledge that he was a lobbyist in circumstances in which she herself was involved. The Tribunal described her soliciting and acceptance of money from O’Callaghan’s lobbyist as “entirely inappropriate” and that such behaviour negated her responsibilities as a councillor. The report noted that the absence of Cllr Guss O’Connell’s from the County Council on 17 December 1992, the date on which votes on a motion relating to Quarryvale were cast, had been beneficial to O’Callaghan. However, it was not satisfied that this situation had been “orchestrated”, as Dunlop had suggested. The Tribunal’s report noted that Cllr John OHalloran “had not been, in general, frank with the Tribunal” in the manner in which he responded to requests for information in relation to payments made by Dunlop and O’Callaghan. In 1993, O’Halloran received an IR£5,000 cheque from O’Callaghan/Riga – and the Tribunal pointed out that, just weeks later, he was one of five signatories to a letter to the Minister for Finance in which tax designation was sought for Quarryvale. O’Halloran also received a payment of IR£250 in or around the time that he signed a motion on Quarryvale, and that he did on occasion receive small payments of IR£500 over the course of the making of the Development Plan 1991 – 1993. The Tribunal was satisfied that O’Halloran solicited a payment of IR£2,500 in 1996 from Dunlop – and that both his request for and acceptance of the money had been corrupt. The Tribunal accepted Dunlop’s evidence that Cllr Pat Rabbitte had been listed as a recipient of IR£3,000 in cash in 1992, and that that sum had later been returned to him by means of a cheque. The report noted that the decision to return the money was due to a concern by Rabbitte and his party colleagues that it would be inappropriate to retain the donation because of Dunlop’s links to the Quarryvale project. The Tribunal commended the decision by Rabbitte to return the money. The report described Cllr Therese Ridge as not merely a staunch supporter of the Quarryvale campaign but also a person who “actively engaged” in providing advice in relation to the strategy generally, and specifically in relation to motions relevant to Quarryvale”. The Tribunal called Ridge an “acknowledged conduit of information to Mr Dunlop” and said that she actively encouraged fellow councillors to support the rezoning of Quarryvale. The report added that she was “handsomely rewarded” for her efforts – both in the form of cash donations totalling IR£1,000 and by Dunlop taking care of printing and other costs associated with her election campaigns. It concluded that such behaviour was inappropriate and compromised her position as a disinterested councillor. The Tribunal was satisfied Tyndal had been lobbied by O’Callghan in relation to the Quarryvale rezoning proposal - and that Tyndal (on behalf of his company Marine & General Insurance Ltd) had likewise lobbied O’Callaghan for his company to be appointed insurance broker to companies associated with O’Callaghan. The report concluded that Tyndal had exploited his position as an elected councillor in circumstances which benefited a company with which he was closely associated – Marine & General Insurances – and that in doing so, he had acted improperly. Tyndal testified that he could not confirm whether he received a donation of IR£500 from O’Callaghan in 1999 – explaining that any such donation would have been paid in the course of a golf classic fundraising event. The report noted that he payment “had little (if anything) to do with Cllr Wright’s candidature in the General Election” – and that it was satisfied that Wright was “fully aware of the true purpose” behind two payments totalling IR£10,000. It concluded that both the providers and recipients of the funds had corruptly paid and received payments under the pretence that they were political donations. Email “Mahon: The verdict on councillors involved in Quarryvale ”. Feedback on “Mahon: The verdict on councillors involved in Quarryvale ”.